When Spring Piatek was treated for Kawasaki disease at Children’s Memorial Hospital in Chicago at age 4, she remembers a nurse staying with her in the middle of the night to tend to her fever. The nurse gave her a grape Popsicle to soothe her raw throat from crying and reduced her fever by placing cool rags on her forehead. She sat by her side and talked with her to calm her down. She thought her calling was in pediatric nursing, but another experience convinced her otherwise. During an internship in nursing school at Northern Illinois University, she gained experience in the oncology unit at Rush Copley Medical Center and was impacted by a young mother who was being treated for leukemia. After graduating from Northern with a B.S. in nursing in 2005, she began working in the oncology unit at Rush Copley and was awarded Employee of the Year in 2007. Despite her success, Piatek wanted to advance in her field and made the decision to go back to NIU part time for a master’s degree in nursing. She graduated from the master’s program in 2013 with a 4.0 GPA and earned her license as an advanced practice nurse with a specialization in oncology. After nine years at Rush Copley and her degree in hand, she was hired by DuPuge Medical Group and gained three years of experience in breast surgery and oncology. She then moved on to Northwestern Medicine in Winfield to work in the High Risk Breast Clinic. 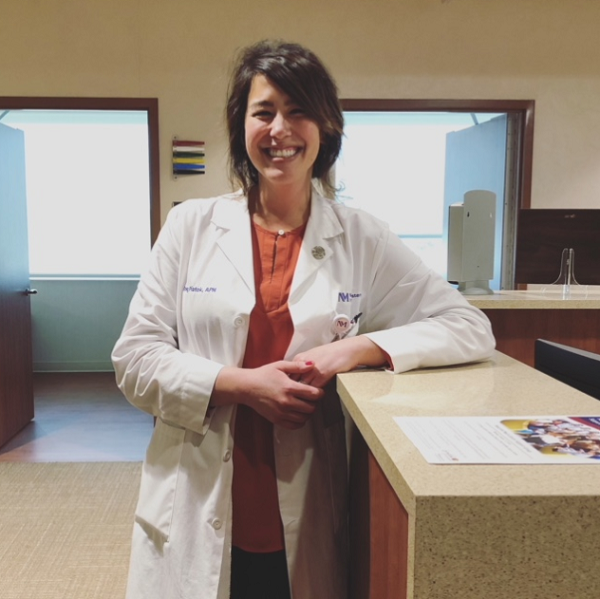 Like the nurse that she had as a child, Piatek is there to listen to, comfort and provide guidance to her patients and their family members, who may be feeling anxiety and stress. A young patient that she met last year at the clinic was referred because both her mother and sister had been diagnosed with breast cancer. During the visit, the patient shared that she had recently felt a lump. Piatek ordered diagnostic imaging, and that lump turned out to be breast cancer. The woman is doing well and has finished her cancer treatment. She told Piatek that she and her family have initiated a charity and survivorship assistance for women with breast cancer to honor their mother, who ended up losing her life to the disease. “These women are the heroes in my eyes. To have the opportunity to care for women like this, to hear their story and help them through what can be a very stressful time, that’s what it’s all about,” Piatek said. She has a long list of educational training, including clinical breast exam certification and certification as an advanced oncology clinical nurse specialist and a breast care nurse. At the end of the day, her husband and daughter are reminders of what’s important in life, Piatek said, and she hopes that she is setting an example for her daughter. “I hope to inspire a passion and work ethic in my daughter in whatever she chooses to do,” she said.